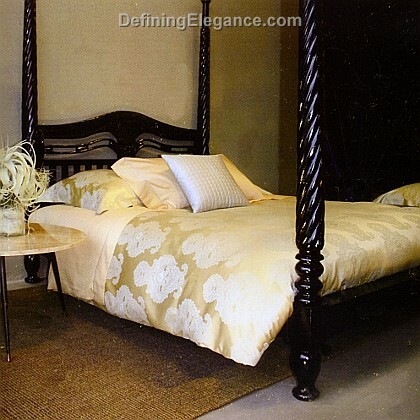 Enjoy this rich luxurious bedding. It is available in mud and stone colorways. 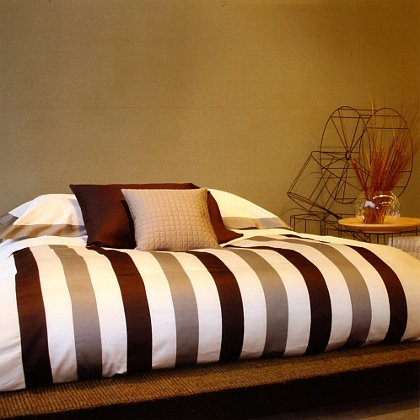 The jacquard duvet cover, reverses to a solid color, with button closure. Signoria Samba is a bright, contemporary bedding collection that evokes movement and joy. This design was inspired by the Brazilian dance, which evolved from the African influence in South America. The Signoria Orfeo bedding collection consists of a colorful striped duvet cover paired with solid shams with a contrasting colored flange. The collection is offered in two colorways: Pearl (stripes in light & dark gray and brown) and Thistle (stripes in eggplant, lavender, and orchid). This collection looks great paired with solid cases and quilted decorative pillows. Signoria Murano, a romantic lace-inspired jacquard 600 thread count bedding collection , is a tribute to the wonderful island of Murano in the Venice lagoon famous for its many talented artisans. Signoria Dore is a modern and elegant alternative to the Signoria Masaccio basic quilt. The coverlets and shams have a circular quilted pattern and are offered in six gorgeous colors. Very unexpected, very chic!